Callie Martin, from my Thorne Hill Series, owns a bookstore and is a huge reader! Here are some of her favorite books she recommends you read ASAP! Though let’s be real. I’ve been counting since the day I picked a release date. I love writing. It’s in my blood, and I don’t think I could ever make myself NOT think of stories to tell. Most of the time, it comes rather easily to me (not to say that I don’t have bad days, crippling doubt, periods where I think I’m a hack and want to give up—that’s a post for another day). Writing is fun. Even editing too. Going back and rereading what I wrote often surprises me in a good way, and the characters feel so real. But publishing…that’s a whole new beast. There are things outside of my control that always worry me: the files don’t upload on time. There’s a glitch in the formatting. Amazon has another issue, like the “buy” option disappearing, or books not showing up in searches…all that sort of thing. I know I cannot control a single one of those things, but it still stresses me out a bit. I put a lot into release day and having things run smoothly can make or break a good release. And then of course, there’s an even scarier aspect of publishing: having your book in the public eye, literally up for review. Not everyone will like my books and I’m fine with that. I write what I like and as long as I’m 100% happy. I’m proud of my book. But I’d be lying if I said the fear of a flopped release didn’t scare me. So much so I get really nervous to hit that pesky “publish” button on my KDP dashboard. I clam up, freak out, and curse myself for choosing to do this as a job. It’s stressful to not know how something will go. But isn’t that what life is all about? Having faith and taking chances? You NEVER know how things will turn out. You can only do your best, put in the work, and have the faith in yourself to take a chance. Because if you never take a chance, you’ll forever be wondering “what if”. Taking risks is scary, trust me, I know. But if you don’t take a risk, you’ll lose a chance. So come Wednesday night when it’s time for me to publish Side Hustle, you bet you can find me scared and probably drinking a glass of wine before I can myself click that little button, but I’m going to do it. Because no matter what, it’s a risk I know is worth taking. 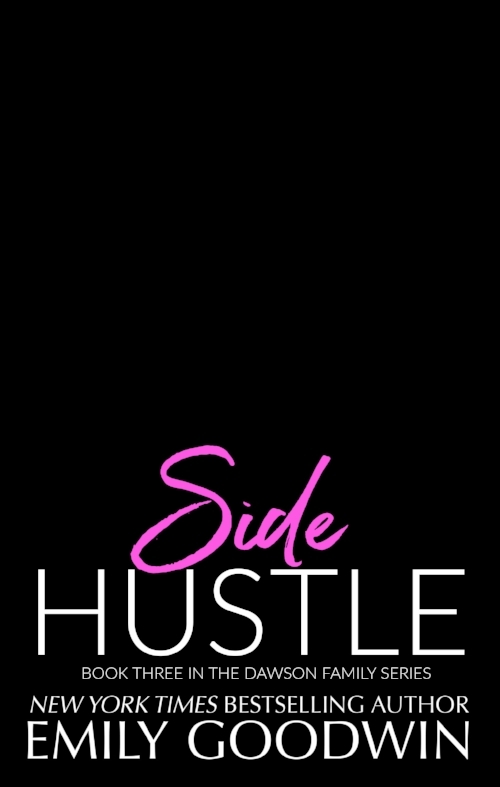 Side Hustle is book three in my Dawson Family Series, and features the oldest of the Dawson siblings, Weston. He’s a small town cop and a single dad (who has hot AF of course). The love interest is Scarlet Cooper, who was a thrill to write. I don’t want to giveaway too much, but swoons I love this book HARD! I still get asked pretty frequently about my Guardian Legacies series. I promise you, I haven't abandoned the series! I love Anora and Ethan and I'm so sorry for leaving you hanging on a cliff hanger for years and years and years! I now publish my paranormal romance under the name Emma Stark. The Guardian books are getting a makeover and will be republished later this year. Unbound, Reaper and Moonlight will be out in October, November, and December.